This past Sunday I was honored to be front row center at Studio 54 for the smashing new review / testimonial / romp / reverential comedic Sondheim fest called in fact Sondheim on Sondheim and hosted in video snippets by the man himself. Barbara Cook and Vanessa Williams and Tom Wopat shine — and I didn’t expect everyone to shine as brightly and I’m not naming names. Five additional performers round out an illustration of how to do such shows. 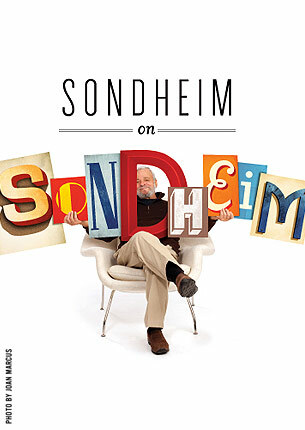 Some of us have seen or heard every Sondheim review crafted by multiple performers — from Side by Side by Sondheim forwards and backwards — to tribute shows and single performer Sondheim-saturated shows. This evening each tune selected was given its due. In full performance .. few snippets or suggestions. Among my favorite moments is a new duet featuring Cook and Williams performing “Not a Day Goes By” and “Losing My Mind” that blew the top of my head off. And from the morphing Bounce (that I saw under that name twice at the Kennedy Center in DC) now renamed Road Show — a sweet and funny two couple treatment (male-female, and male-male as the ballad now plays in the current version) of the amazing love song “You Are The Best Thing That Ever Has Happened To Me.” So … sighing and being quietly thrilled was the name of the game for me that evening, and the feeling has carried into the week, into travel to DC for a seder and to Maryland for a work site visit and back home to Philly to wade through other obligations. The magic and the mastery play in my mind. I return to some reflections of my own from over a year ago on a public master class given by Barbara Cook on the campus of Northwestern University in Evanston, Illinois. Just north of Chicago where I then lived, totally unaware at that time that sojourns to Philly and to New York City were in my future. So Cook the master in performance leads me to Cook the master in instructing young singers in finding the heart of a song. Ms. Cook. 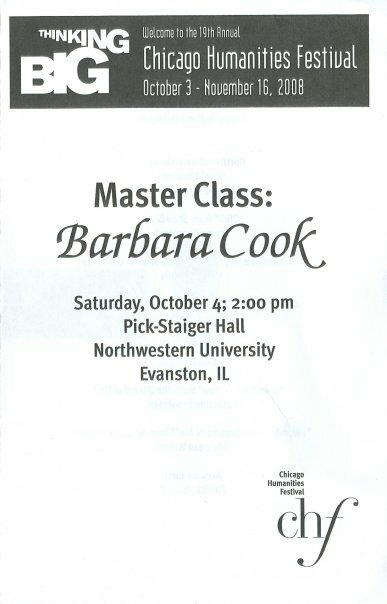 Saturday October 4, 2008 I attended a masterful public master class with soon-to-be 81 year-old Barbara Cook. And several talented, young, voice students. For two hours or so, master performer, chanteuse, Broadway legend Barbara Cook regaled a thrilled and rapt audience at Northwestern University’s Pick-Staiger Hall with stories of her life (a little) and thoughtful advice for six young singing talents in presentation, in finding the heart of a song, in exposing themselves on stage, in telling the story. Words from the master, as I scribbled them, sometimes directed to individual singers, sometimes addressing herself, sometimes speaking directly to the audience. All wise. And about much more than singing. In my mind. “Think of the notes as a graduated string of pearls.” [to a young man who had been, in an initial run through “skittering on the top of a song” in Ms. Cook’s words and indulging a bit in exaggerated phrasing, as habit]: oh my. yes. And there were two mentions of the world’s greatest entertainer. 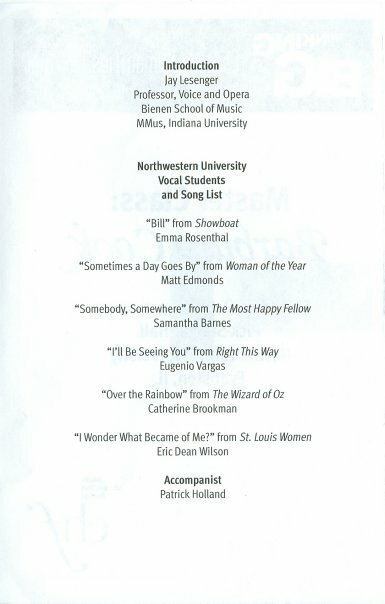 It was striking that these mentions did not occur when one of the performers had the chutzpah to perform (and quite well actually, quietly, contemplatively, emotionally, with verse) “Over the Rainbow” as the program notes indicate. Ms. Cook took that performer and her choice of song, as she did each performer with each choice they had made and prepared, on their own terms. She did not talk about who all she had known (and it would be scores of performers) who had done different versions of these tunes. Nor did she sing herself to say “here kid, this is how you do it” though she did sometimes illustrate a point about phrasing or interpretation, to our endless delight, by singing some phrases. No, these were colleagues in her view. She treated them with respect and care. It was touching and emotional on that level alone. 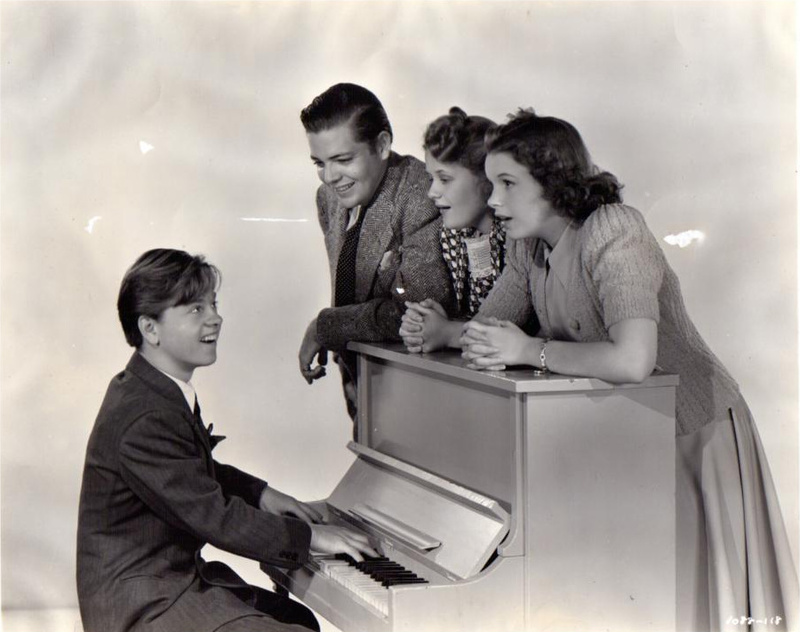 (L-R) Mickey Rooney, Douglas McPhail, Betty Jaynes, Judy Garland. Babes in Arms (1939). Publicity photo. But back to Garland. Cook mentioned her twice. First in answer to why she chose stage over movies in her career. Her reply was that she loved movies always. But even as a child, when “watching Judy and Mickey putting on a show,” she wanted to be in the show IN the movie, not the movie. I liked that. Second, she noted that “Mabel Mercer and Judy Garland had the most impact on my work.” She elaborated on the Mercer effect, in part because she wondered whether everyone in the audience knew of Mercer and her consummate skill with lyrics and phrasing and articulation. She did not elaborate upon the Garland effects; I would have grilled her just to hear her gush. In the audience I spied many local musical theatre stars and at least one of the major Chicago theatre critics, who may have been there on her own (as I was, off the clock, just enjoying myself). It was a special afternoon.